What Is the Best Air Conditioner For An Attic? One of the problems you face when looking to install air conditioning in your attic is the lack of duct work. It is very expensive and messy to tear out walls and add duct work and connect to your current ac system. There is a cost effective and simple option to provide air conditioning to your attic without the cost and hassle of installing ductwork. It is called a split system. A split system is exactly what it sounds like. There is an outdoor and indoor unit. This eliminates the need to tear down walls to install ductwork. These ductless systems can also provide heat in the winter! While this is a convenient solution to providing cooling and heating to attic and other rooms, Are they cost effective? 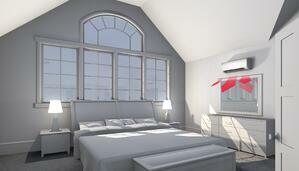 Unlike window air conditioner units, these ductless ac systems can cool and heat your attic. No ductwork needed. Only a small opening is needed to connect the indoor and outdoor units to complete the split system installation. Conventional cooling and heating systems turn on and off. This wastes energy. The technology in modern split system units uses the exact amount of energy needed to cool or heat an area without turning on or off. Up to 40% more efficient than traditional systems. The wall mounted attic ac unit shown in the pictures above can maintain the ideal temperature you set in a single room. Don't forget they also can provide heat to your attic space. Ductless solutions systems deliver cooled and heated air directly to the rooms they serve, without the need for noisy fans. You never have to hear the disruptive clanging of a central air system turning on and off again. With these systems, that noise is a thing of the past. Learn more on our Split Systems Heating and Cooling Page.